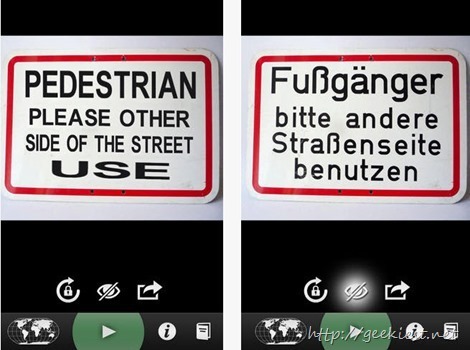 Word Lens Translator is a wonderful app for travellers who used to visit other countries. This application can translate any visual (printed text) to your own language. What you will have to do is just use the application camera to the visual you want to translate. It will change the words on the same place just like the above images. One another important thing is that, you will not need any network connection for the translation. This application works on regular and standard fonts and will not work on stylized fonts and handwriting. The application is a Free application. All the language translations are also free. Tried few boards on internet and it worked fine. You can get this application for your Android devices from Play store and for your iOS devices from iTunes (Requires iOS 6.1 or later. Compatible with iPhone, iPad, and iPod touch. This app is optimized for iPhone 5).